In Keeping Pace 2015 we wrote extensively about state virtual schools, in particular noting some of the new directions that state virtual schools are taking as they face increasing competition from other providers and from districts developing their own online content. This past week we met with a group of state virtual schools that are part of the Virtual School Leadership Alliance, and found that they continue to grow and evolve. Keeping Pace characterizes state virtual schools as operational intermediate supplier organizations that provide online learning programs to schools statewide. They were created by legislation or by state level agencies, usually funded in part or entirely by a state appropriation or grant. State virtual schools are not actually “schools” in the traditional sense. 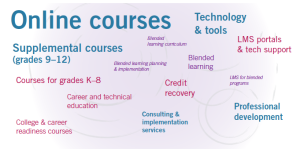 They supply online courses and related services to schools. With the exception of state virtual schools in states with course access policies, students are usually enrolled with district approval. Even then the school or district plays an integral role in counseling and enrolling students in the state virtual school. As further evidence of the way that state virtual schools are evolving, many of the state virtual schools that we met with this past week shared extensive programs and practices that go well beyond providing supplemental online courses. For example, VirtualSC has been identified as an integral part of South Carolina’s K-12 educational delivery system by the governor, in part as a portion of a response to a lawsuit that requires that the state provide more equitable options to all districts. In addition to supplemental online courses, Virtual SC provides test prep (SAT and ACT) for high school students, and a keyboarding program for elementary students. Keyboarding has been particularly popular, attracting more than 29,000 students in 32 districts this year. The state virtual school in New Mexico, IDEAL-NM, offers a learning management system and training to teachers and students across the state, and estimates that 70% of the students in grades 6-12 have student accounts. Georgia Virtual School makes its online course content available as an open educational resource to schools across the state and beyond. And Michigan Virtual University, through its research arm the Michigan Virtual Learning Research Institute™, is providing perhaps the single best data set of online courses being taken by students in any state. These aren’t the only examples; all of the members of the Leadership Alliance have programs that are extending their services beyond simply offering supplemental online courses, and other public supplemental programs such as the Southwest Colorado eSchool are taking similar approaches as well.